I can trace my love of mixology through the evolution of my standards for homemade pisco sours. Like many Americans, I first discovered this delicious quaff on a trip to Peru. I had one every chance I could get, and picked up a bottle of acholado pisco at the duty free, along with some packets of pisco sour mix. I was told this was a way to make a decent pisco sour, especially since we can’t get the right citrus here in the US, and for a while, I believed that. Then I decided to try to mix my own. As I documented in my very first cocktail post, I didn’t think I could get a wonderful foamy head on a pisco sour without resorting to a blender. Now that I’m building my skills as a home bartender, I’ve discovered I can create an egg white drink with a gorgeous, foamy froth on top with just my shaker and some effort. My favorite secret is using the dry shake. Put all the ingredients in the shaker with no ice, give a vigorous shake for at least 10 seconds. Then add the ice and shake again, for as long as you can stand it. I aim for at least a minute. The result is luscious, rich, and tastes all the better for knowing the effort I put into it. Who knows, maybe the next step in my journey is to start scorching my sours. I am definitely eying the milk whippers that all the cool bars in town are using for foaming their egg-white drinks. For nearly a year, my standard pisco sour recipe has been 3 : 2 : 1 pisco : simple syrup : lime juice. This makes for a dangerously drinkable beverage that always seems to go down too fast. Lately I’ve been tinkering with the recipe to bring the pisco more to the forefront and up the sour. The result is a drink that I sip more slowly, and I enjoy more. Dry shake everything but the bitters for at least 10 seconds. Add ice and shake for 1 minute. Strain into cocktail glass and top with 1-2 drops bitters. Peru and Chile dispute the origin of both pisco and the pisco sour. You may guess from the above where my opinion lies. Regardless of your feelings, remember that the first Saturday of February is Peru’s National Pisco Sour Day. That sounds like a damn fine reason to make a round and toast. ¡Viva Perú! I’ll have to try the “dry shake” method! You don’t mix the bitters into the drink, though? Or do you mix some in, and float the other? The bitters just go on the top, not in the shaker. I’ve updated the recipe because that wasn’t clear at all. Thanks for pointing that out! Nice Pisco sour Stevi! oh how i wish i could get something else than Capel here..never yet tried Peruvian Pisco. I just came back from a cruise/tour in South America. We were served pisco sours everywhere in Chile, but not at all in Argentina. 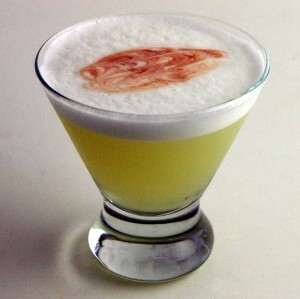 I really like pisco sours, but I recognized the danger of drinkinng more than two. I had never heard of pisco sours before this trip. I have copied down your recipe but I have a question. Our group was served piscos and i didn’t notice any foam (from egg whites) on the top. Also, I did not detect any color trace of bitters. Did they leave these two ingredients our or does this happen when they make pisco sours in large batches and pour them into the glasses? Can you get a pisco sour in an American bar? Can you buy pisco in a US liquor store? Thank you for any informaiton. I’m not sure why your sours had no egg white foam or bitters on top! Not sure where you’re located, but there are US liquor stores that carry pisco, and some of the stores that will do mail order have it as well. There’s a few bars that will have a pisco sour on the menu; it’s becoming popular in San Francisco, I’m told. Excelent, And is real, we can make good pisco sours even we don’t have the citrus, rememeber the best pisco sours are made with pisco quebranta (no aromatic), and the acholados (a blended quebranta-italia, grapes). Also the newsletter monthly of elpiscoesdelperu.com spreads the pisco culture since 2006. We have all the ingredients at home, brought some from Peru and some from (latin) peruvian stores in LA. You should try next time Algarrobina cocktail (another peruvian drink with pisco) is also very good! I did have an algarrobina cocktail when I was in Peru. Thanks for reminding me about it. I’ll have to track some down and try making it at home! @Krl Roman: nice try, but Pisco is from PERU!! Chile tries to copy but the origins are in Peru, there is even a city called Pisco in Peru. @Stevi: Thx for sharing your experiences. Pisco sour is definitely my favorite Cocktail! I use 3 shots Pisco Acholado, 1.5 shots of Jarabe de goma (imported from Peru) and 1 shot of freshly squeezed lime juice. I found the small limes work the best, the bigger ones or the lemons just don’t give the right flavor or strength. Blend it all together, add egg white and then add two cups of ice. Listo! Salut and Prost! Pisco, a couple of notions. Drink Italia neat w/a bit o’ lime- the others aren’t up to snuff- careful with pisco puro, if you’re going to drink pisco sauers (así es, compadrito), pay attention to the jarabe- make it yourself, find good ingredients (a buen entendedor, pocas palabras). As for pisco, all the good stuff is buried in people’s jardin’s right now. Try throwing in some dried apricot’s. The new thing (not so new)- pisco sauers de frozen camu-camu- cosa seria, mamita. Don’t drink BarSol, never drink pisco chileno and avoid Pisco Vargas at all costs. La Botija is fine for most palates. Most of the expensive stuff is long on price, and that’s it. Ocucaje is fine as well, Tacama- factory stuff. In Peru, go to Barranco, bajo el puente, a Toto’s, dile a don Jorge que te mandó el duende and ask for the stuff from la familia en Ica. I have heard from those who have traveled in Chile that they are NOT served with the egg white there. My boyfriend insists on no egg white. Amazing drink. We have always added the egg whites at the end to make the froth. Also agree that the small limes are the best and recommend Pisco Biondi! If you are using Chilean pisco, I would use less sugar because it is sweeter. Dry shaking tastes better than blended because it takes more love! Gotta shake over each shoulder too ; ) Salud!!! I’m definitely going to add shaking over each shoulder to my shaking repertoire! Cocktail Hacker » Blog Archive » Pisco Sour - Cold. Frothy. Delicious.